You shouldn’t be surprised when you eventually have a loose toilet handle, like a flooded toilet, it is only a matter of time before it happens. Toilet handles are used so often, so over time of course they will begin to loosen up. That’s why you’d do well to bookmark this article on how to fix a loose toilet handle, for the inevitable time when it happens to you. You’ll have all the knowledge at your fingertips that you need to fix the problem quickly and carry on with your daily routine without calling in a plumber! Can I Really Fix A Loose Toilet Handle Myself? Yes, yes you can! With a few simple tools and some basic knowledge about toilet anatomy, a loose toilet handle is no big deal. However, even though a loose toilet handle isn’t hard to fix, that doesn’t mean it should be ignored. Over time, a loose toilet handle can lower the efficiency of your toilet which in the end, can increase your water bills. Is My Toilet Handle Loose? When you move the handle up and down, is there no effect on the toilet? If there’s no effect, then you have a loose toilet handle. 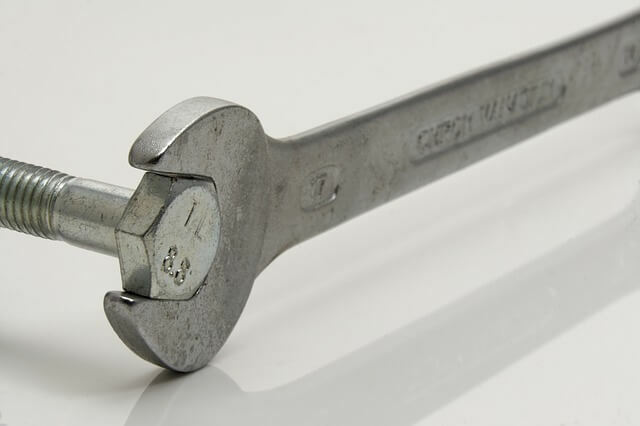 All you’ll likely need is an adjustable wrench, but you may need a brush + vinegar too. Shut off the water to the toilet. The supply pipe and shutoff valve should be behind the toilet. Turn the valve clockwise to shut off the water. Remove the toilet tank lid by simply lifting it up. Empty the tank of water by flushing the toilet once (it’s easier to fix the loose toilet handle when there’s no water in the tank). Turn the toilet lever nut on the inner part of your tank counterclockwise to tighten the nut. Yes, counterclockwise is correct – in the US, toilet lever nuts are reverse threaded, which means you need to turn the nut counterclockwise to tighten it. Keep turning until you begin to feel resistance, and then stop; you don’t want to push past the resistance as you might crack the porcelain. Restore the toilet tank lid and turn the water back on. The toilet handle should now be fixed and working properly. Now try pushing the handle down as if you were flushing the toilet. If the handle doesn’t go down all the way, it’s too tight. Try loosening the nut one rotation at a time. Remember to turn it clockwise to loosen it. If it’s now too hard to push the handle down to make it flush, then the problem is likely the toilet chain. The chain might be too long, in which case you should shorten the length of the chain. Instructions on how to do this can be found here. If your toilet handle is still loose, then there might be a problem with the mounting nut. This nut is located right on the back of the toilet handle on the inner part of the toilet. Wipe the mounting nut with the brush. Use the vinegar on the brush if you notice any lime residue. If all of this fails to fix your loose toilet handle, then you may have to resort to calling in an expert.